from the BBC programme Desert Island Discs, 23 November 2008. She has made numerous television appearances on discussion programmes including Question Time, reality shows including I'm a Celebrity... Get Me Out of Here! and Celebrity MasterChef and on panel games including Have I Got News for You. Since 2011, she has been a regular panellist on the ITV lifestyle and chat show Loose Women. Street-Porter was born in Brentford, Middlesex, the daughter of Stanley W G Bull, an electrical engineer who had served as a sergeant in the Royal Corps of Signals in World War II and Cherry Cuff Ardern (née Jones) who was Welsh and worked as a school dinner lady and in the civil service as a clerical assistant in a tax office. Her mother was still married to her first husband, George Ardern, at the time, and was not to marry Stanley until 1954, hence her name being recorded thus in the birth records. She was later to take her father's surname. Street-Porter grew up in Fulham, west London and Perivale, Greater London after the family moved there when she was 14 and the family would stay in her mother's home town of Llanfairfechan in North Wales for their holidays. She attended Peterborough Primary and Junior Schools in Fulham and Lady Margaret Grammar School for Girls (now Lady Margaret School) in Parsons Green from 1958 to 1964 where she passed 8 O-levels and 3 A-levels in English, History and Art. She also took an A-level in pure mathematics but did not pass the exam. Whilst studying A-levels, she had an illegal abortion. She then spent two years at the Architectural Association School of Architecture, where she met her first husband, photographer Tim Street-Porter. Street-Porter became fashion editor of the Evening Standard in 1971. When the LBC local radio station began to broadcast in 1973, Street-Porter co-presented a mid-morning show with Fleet Street columnist Paul Callan. The intention was sharply to contrast the urbane Callan and the urban Street-Porter. Their respective accents became known to the station's studio engineers as "cut-glass" and "cut-froat." Friction between the ill-matched pair involved constant one-upmanship that made for compelling listening. In early 1975, Street-Porter was launch editor of Sell Out, an offshoot of the London listings magazine Time Out, with its publisher and her second husband, Tony Elliott. The magazine was not a success. Street-Porter started in television at LWT in 1975, first as a reporter on a series of mainly youth-oriented programmes, including The London Weekend Show (1975–79), then went on to present the late-night chat show Saturday Night People (1978–80) with Clive James and Russell Harty. She later produced Twentieth Century Box (1980–82), presented by Danny Baker. Street-Porter was editor of the Network 7 series on Channel Four from 1987. In the same year, BBC2 controller Alan Yentob appointed her to become head of youth and entertainment features, making her responsible for the twice-weekly DEF II. She commissioned Rapido, Red Dwarf and Rough Guide, and she was behind the cancellation of the long-running music series The Old Grey Whistle Test. Her Network 7 show was awarded a BAFTA for its graphics in 1988. In 1992, Street-Porter provided the story for The Vampyr: A Soap Opera, the BBC's adaptation of Heinrich August Marschner's opera Der Vampyr, which featured a new libretto by Charles Hart. Street-Porter's approach did not endear her to critics, who objected to her diction and questioned her suitability as an influence on Britain's youth. In her final year at the BBC, she became head of independent commissioning. She left the BBC for Mirror Group Newspapers in 1994 to become joint-managing director with Kelvin MacKenzie of the ill-fated L!VE TV channel. She left after four months. In 1996, Street-Porter set up her own production company. Since 1996, Street-Porter has appeared several times on the BBC panel game Have I Got News for You, most recently in May 2016. Since 1998, Street-Porter has appeared annually on BBC's Question Time except in 2013. In 2000, Street-Porter was nominated for the "Mae West Award for the Most Outspoken Woman in the Industry" at Carlton Television's Women in Film and Television Awards. In 2007, Street-Porter starred in an ITV2 reality show called Deadline, serving as a tough-talking editor who worked with a team of celebrity "reporters" whose job it was to produce a weekly gossip magazine. The celebrities in question had to endure the Street-Porter tongue as she decided each week which of them to fire. In 2011, Street-Porter became a regular panellist on ITV's chat show Loose Women. In 2013, she appeared in Celebrity MasterChef reaching the final three. She also appeared in the television show QI. Since 1 September 2014, Street-Porter has co-hosted BBC One cookery programme A Taste of Britain with chef Brian Turner and ran for 20 episodes in one series. Street-Porter has appeared on numerous reality TV shows, including Call Me a Cabbie and So You Think You Can Teach; the latter saw her trying to work as a primary school teacher. She conducted numerous interviews with business figures and others for Bloomberg TV. Street-Porter became editor of the Independent on Sunday in 1999. Despite derision from her critics, she took the paper's circulation up to 270,460, an increase of 11.6 per cent. In 2002, Street-Porter became editor-at-large as well as writing a regular column. Knowing that he was an alcoholic is critical to understanding his sense of disorientation and his attitude towards the police, which might on first viewing of the video footage, seem a bit stroppy. A prominent rambler, Street-Porter was president of the Ramblers' Association for two years from 1994. She walked across Britain from Dungeness in Kent to Conwy in Wales for the television series Coast to Coast in 1998. Street-Porter also walked from Edinburgh to London in a straight line in 1998, for a television series and her book, As the Crow Flies. In 1994, for the documentary series The Longest Walk, Street-Porter visited long-distance walker Ffyona Campbell on the last section of her round-the-world walk. In 1966, Street-Porter appeared as an extra in the nightclub scene in Blowup, dancing in a silver coat and striped trousers. In 2003, she wrote and presented a one-woman show at the Edinburgh Festival titled All the Rage. She published the autobiographical Baggage in 2004, about her childhood in working class London. Its sequel is titled Fallout. Life's Too F***ing Short is a volume which presents, as she puts it, her answer to "getting what you want out of life by the most direct route." While studying architecture, Street-Porter married another student, Tim Street-Porter. Street-Porter has homes in Nidderdale, North Yorkshire, Kent and London. An active member of the Nidderdale community, she contributes her time and energy to a number of local causes. She is currently the president of the Burley Bridge Association, leading a campaign for a crossing over the River Wharfe linking North and West Yorkshire. Street-Porter holds a criminal record for possession of cannabis after a raid on her home in the late 1960’s. She was appointed Commander of the Order of the British Empire (CBE) in the 2016 Birthday Honours for services to journalism and broadcasting. ^ Branigan, Tania (19 November 2004). "The Guardian profile: Janet Street-Porter". The Guardian. Retrieved 8 December 2016. ^ "Janet Street-Porter". Desert Island Discs. 23 November 2008. BBC Radio 4. Retrieved 18 January 2014. 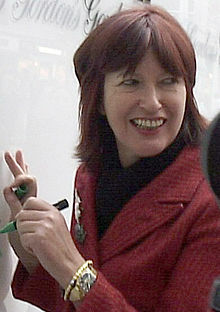 ^ a b c d Janet Street-Porter (2004). Baggage – My Childhood. Headline. ISBN 0755312651. ^ a b c d e f g h "BFI Screenonline: Street-Porter, Janet (1946–) Biography". Screenonline.org.uk. 19 March 1996. Retrieved 21 February 2015. ^ "Magazine launches & events 1975–89". Magforum.com. Retrieved 23 September 2011. ^ a b c Stuart Jeffries. "Interview: Janet Street-Porter talks to Stuart Jeffries | Media | The Guardian". Media.guardian.co.uk. Retrieved 21 February 2015. ^ Kershaw, Andy (2012). No Off Switch. Virgin. p. 213. ISBN 978-0415892131. ^ "BBC One – Have I Got News for You, Series 51, Episode 5". Bbc.co.uk. Retrieved 11 May 2016. ^ "BBC One – A Taste of Britain". Bbc.co.uk. Retrieved 21 February 2015. ^ "Editor-at-Large: Tomlinson was no saint, but he deserved better – Janet Street-Porter – Columnists". The Independent. 12 April 2009. Retrieved 21 February 2015. ^ "The Dales: A lifelong romance – UK – Travel". The Independent. 6 November 2005. Retrieved 21 February 2015. ^ Lynn Barber. "Janet Street-Porter tells Lynn Barber that she has no intention of mellowing with age | Media". The Guardian. Retrieved 21 February 2015. ^ "BBA: Burley Bridge News". Burleybridge.com. Archived from the original on 5 September 2013. Retrieved 21 February 2015. ^ "Loose Women star SHOCKS as she reveals she has criminal record". HELLO!. 17 April 2019. Retrieved 18 April 2019. ^ "Janet Street-Porter". petshopboys.co.uk. 28 April 2004.